Published: Sept. 14, 2015 at 07:30 p.m. Published: Sept. 3, 2015 at 07:22 p.m. Published: Dec. 28, 2014 at 01:29 p.m.
New York Jets wide receiver Chris Owusu takes a pitch from quarterback Geno Smith for a 23-yard touchdown. 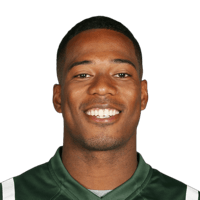 Published: Dec. 28, 2014 at 01:26 p.m.
New York Jets quarterback Geno Smith throws a 36-yard pass to wide receiver Chris Owusu who makes a nice leaping grab.